People in the United States probably knew very little and thought even less about corporal punishment until Adrian Peterson made headlines. Then they all started talking. Picture after picture of his four-year-old with bloody cuts all over his legs filled the web. Society was shocked that a grown man would do this to a four-year-old-child. Though Adrian Peterson pled no contest, meaning he neither admitted nor denied abusing his child, news articles reported that he confessed to hitting his four-year-old child. Nevertheless, everyone was talking about it. It spurred a national debate. How could a 6'1, 217 pound, 29 year-old NFL Star beat his child to the point it caused cuts and blood? Uniformly, the American people were alarmed. A discussion started. Consequently, a national discussion started. People asked if parents should be allowed to use corporal punishment against their children. What are the effects of its use? Where is the line between appropriate physical discipline and abuse? Did parents have a right to physically discipline their child? But something was missing from these questions. What was missing is the question, "Does someone else have a right to hit another's child?" How much more enraged would society be if another person made these marks on Adrian Peterson's son? This is happening. It is called corporal punishment in schools and it is legal in 19 states, including Louisiana. Many people are oblivious to physical discipline at school. For instance, we have talked to many people, including teachers and legislators, who believe teachers and school faculty simply do not hit children. In fact, a Louisiana legislator who was a passionate, outspoken advocate against school corporal punishment recently advised us that corporal punishment stopped happening altogether during the last few years. With disbelief, we made our next move. The data listed corporal punishment incidents by parish for each school year (for those not from Louisiana, parish is just another way to say county). We started to analyze the data for the 2011-2012 school year. We then ranked the ten parishes with the highest rates of reported incidents of school corporal punishment for that year. 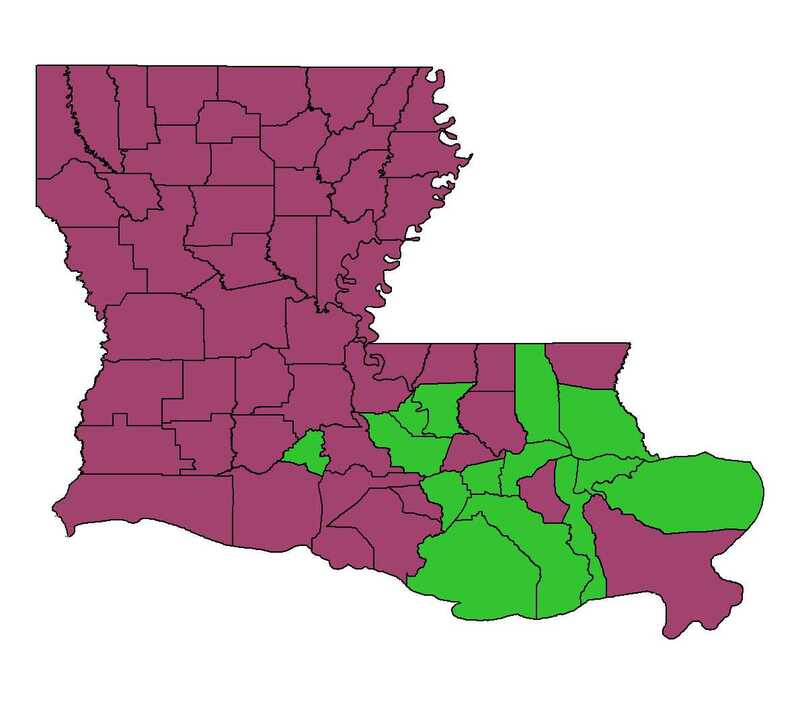 Parishes that allow corporal punishment in purple; parishes that ban corporal punishment in green. With this information, we studied specific demographics of these parishes. This included education level, race, income level, and religious affiliation. We also examined whether the parishes' communities were mostly urban or rural. Did these parishes have anything in common? Was there a trend? What did the data show? The Louisiana Department of Education showed 4,460 reported incidents of corporal punishment against students in the 2011-2012 school year. During that time, Louisiana's student population was about 708,400 students. These figures show the reported corporal punishment incidents in Louisiana schools for 2011-2012 school year to be at a rate of 6.3 per 1,000 students. Some may think that Louisiana's rate of corporal punishment is relatively low and not a cause for concern. 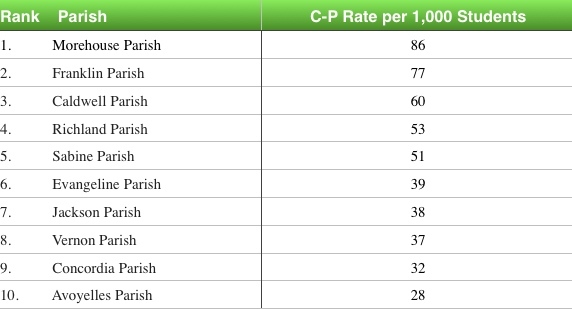 Things, however, become more alarming when you look at the top ten parishes with the highest rate of corporal punishment. 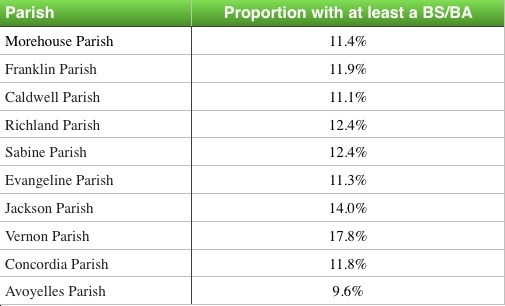 For instance, Table 1 shows there is a rate of 86 corporal punishment per 1,000 students. 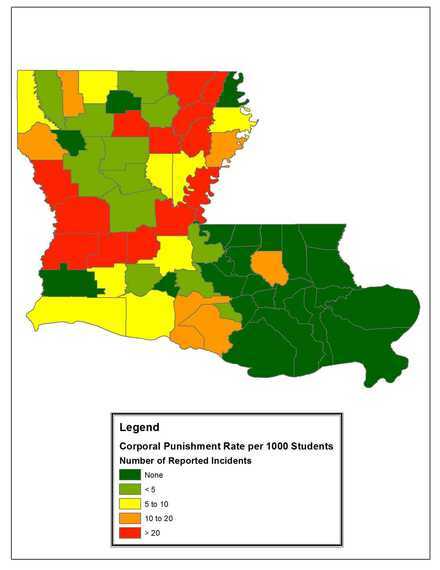 The ten parishes with the highest rate of corporal punishment have several things in common. These parishes are predominantly rural, far from a major interstate highway. Most of these parishes generally consist of a majority white population, who identify themselves as Evangelical Christians. Specifically, these ten parishes' average Evangelical Christian population is 67 percent, according to Social Explorer data. The most telling, however, is the level of education in these parishes. The ten parishes with the highest rate of corporal punishment tended to have fewer college graduates than the state's average and the national average of college graduates. For instance, the average proportion of college graduates for the parishes with the ten highest rates of corporal punishment, according to the 2010 census, was 12.4 percent. This number is almost half the college graduation rate for the state of Louisiana (21.4 percent), and much lower than the national college graduation rate (28.5 percent). This may not just be a Louisiana trend. The top six states with the highest percentage of corporal punishment for the 2005-2006 school year were also reported to have the lowest number of college graduates in 2007, according to the United States Census Bureau. For instance, Mississippi was ranked number one with the highest rate of corporal punishment for the 2005-2006 school year. Mississippi was also ranked number forty-seven in 2007, on a scale from one to 49, for persons over twenty-five with a bachelor's degree. In other words, Mississippi was two slots away from having the lowest level of college graduates over the age of twenty-five in the nation. What about Adrian Peterson? 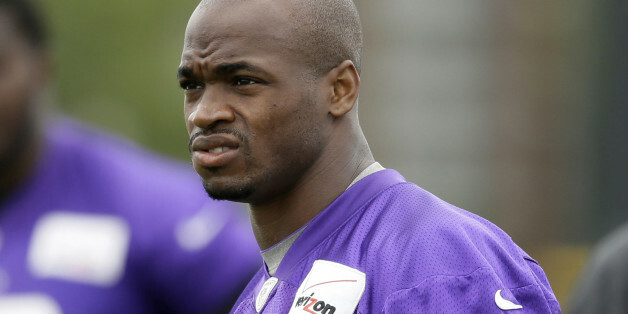 What about where Adrian Peterson grew up? Did he live in a county that allowed corporal punishment in schools? If yes, what characteristics did the county have? Were there similarities between his county and the parishes in Louisiana with the highest rates of corporal punishment in schools? Adrian Peterson grew up in Palestine, Texas. Palestine sits in Anderson County. Anderson County allows corporal punishment in schools. Do people in Adrian's hometown embrace corporal punishment with open arms or do they shun it? "The issue was never a matter of debate in Palestine: Peterson is not an abuser. In this surprisingly sprawling town of about 18,600, the switch and the paddle are as much a part of childhood as Sunday school, hunting and fishing; it is the sort of place where people are God-fearing, disarmingly candid and suspicious of outsiders who would suggest they're wrong for supporting corporal punishment or Peterson, their most famous native son." Like the Louisiana parishes with the highest rates of corporal punishment, Anderson County is rural, and consists of a majority white population. While a high percentage of Louisiana parishes with the highest rates of corporal punishment had populations that identified themselves as Evangelical Christians, a high percentage of Anderson County's population identified itself as Evangelical Protestants. Specifically, 71 percent of Anderson County's population that claimed a religion identified themselves as Evangelical Protestants. What about the level of education in Anderson County? Anderson County also tended to have a lower percentage of college graduates compared to the state's average and the national average of college graduates over the age of twenty-five. For example, the proportion of college graduates in Anderson County, according to the 2008-2012 Census, was 10.1 percent. This number is less than half the college graduation rate for the state of Texas (26.3 percent), and much lower than the national college graduation rate (28.5 percent). Is all this data a coincidence or is there something to it? What do you think?